When light propagates as a guided wave in a fiber core, it experiences some power losses. These are particularly important for long-haul data transmission through fiber-optic telecom cables. Usually, the propagation losses are approximately constant on the way, with some attenuation coefficient α. The power then simply decays in proportion to exp(−α z), where z is the propagation distance. The losses are often specified in dB/km; that value is ≈4.343 times the power attenuation coefficient in 1/km. 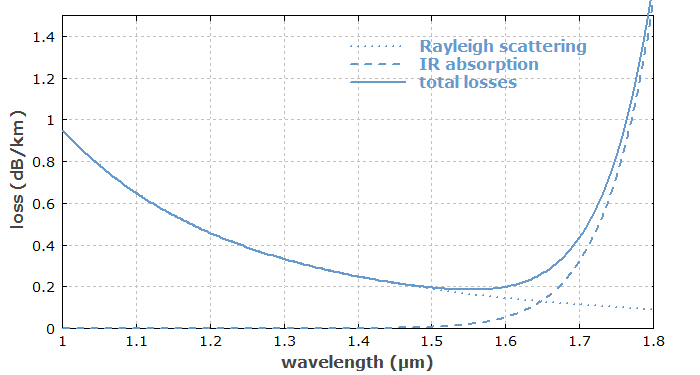 Of course, the losses are dependent on the optical wavelength. The material may have some intrinsic absorption. For example, silica fibers increasingly absorb light when the wavelength gets longer than ≈1.7 μm. Therefore, they are rarely used for wavelengths longer than 2 μm. Additional isolated absorption peaks can result from certain impurities. For example, silica fibers exhibit increased absorption losses around 1.39 μm and 1.24 μm if the core material is not water-free. At short wavelengths, Rayleigh scattering in the glass becomes more and more important; the contribution of Rayleigh scattering to the attenuation coefficient scales with the inverse fourth power of the wavelength. Note that the core glass, being an amorphous material, is microscopically never fully homogeneous; there are “frozen-in” density fluctuations which are unavoidable even with most modern fiber fabrication technology. There is also some inelastic scattering – spontaneous Raman scattering and Brillouin scattering. These effects are measurable via the scattered (and frequency-shifted) light, but normally do not contribute substantially to propagation losses. However, Raman and Brillouin scattering can lead to huge losses (by transfer of energy to other wavelengths) at high optical intensities, where stimulated scattering is possible. This is a nonlinear effect, and is treated in part 11. Increased scattering losses can result from irregularities of the core/cladding interface. This problem is more severe for fibers with large refractive index contrast (high numerical aperture). Also, a large index contrast often means higher germania doping of the core, which makes it tentatively less homogeneous. Therefore, low-loss single-mode fibers for long-haul data transmission through telecom fiber cables are made with relatively small NA, even though a higher NA would provide a more robust guidance. Further, there can be bend losses (see below). Intrinsic losses are usually quite uniform over the length of a fiber. For additional losses, that is not necessarily the case; for example, irregularities of the core/cladding interface or chemical impurities may not be smoothly distributed. Figure 1 shows the intrinsic unavoidable propagation losses of silica fibers. There is a loss minimum of ≈ 0.2 dB/km around 1.55 μm (which happens to be the wavelength region where erbium-doped fiber amplifiers work well). Some telecom fibers as developed for long-haul optical fiber communications nearly reach that low loss level, which requires a very pure glass material. If the fiber contains hydroxyl (OH) ions, additional peaks at 1.39 μm and 1.24 μm can be seen in the loss spectrum. Figure 1: Intrinsic losses of silica. At long wavelengths, infrared absorption related to vibrational resonances are dominating. At shorter wavelengths, Rayleigh scattering at the unavoidable density fluctuations of the glass is more important. If the fiber losses are only 0.2 dB/km, this means that even after 100 km of propagation distance one still has 1% of the original optical power. That is often sufficient for reliable detection of data signals, even at very high bit rates. Multimode fibers often have somewhat higher propagation losses, because they often have a higher numerical aperture. Bend losses are propagation losses which arise from strong bending of a fiber, for example. Typically, such losses are negligibly small under normal conditions, but steeply increase once a certain critical bend radius is reached. That critical radius is rather small for fibers with robust guiding characteristics (high numerical aperture) – it can be as small as a few millimeters. However, for single-mode fibers with large effective mode areas (large mode area fibers having a very low numerical aperture), it can be much larger – often tens of centimeters. Such fibers then have to be kept quite straight during use. 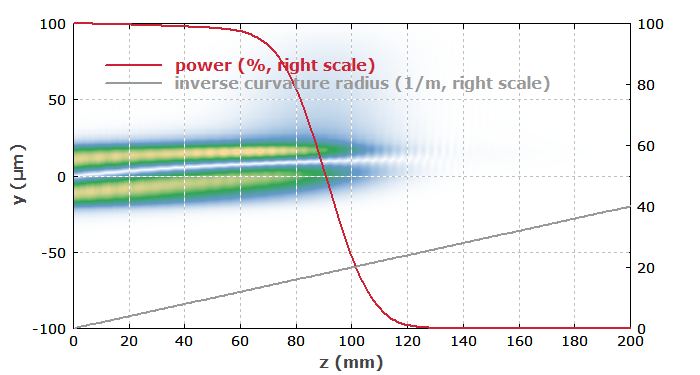 The RP Fiber Power software allows one to simulate light propagation in fibers with arbitrary evolution of the bend radius. For the calculation of bend losses, there are certain analytical formulas, based on simplified models, which may or may not accurately reflect reality. Numerical beam propagation is often the method of choice; it does not require stronger simplifications and tells us in detail what happens to the light. As an example, consider a few-mode fiber with a core radius of 20 μm and a low numerical aperture of 0.05. As a test, we arrange the fiber such that the bending becomes tighter and tighter along the length of the fiber: the inverse radius of curvature increases linearly with the propagation distance. The launched light is entirely in the fundamental mode. Figure 2: Amplitude distribution along the fiber for increasing bending. 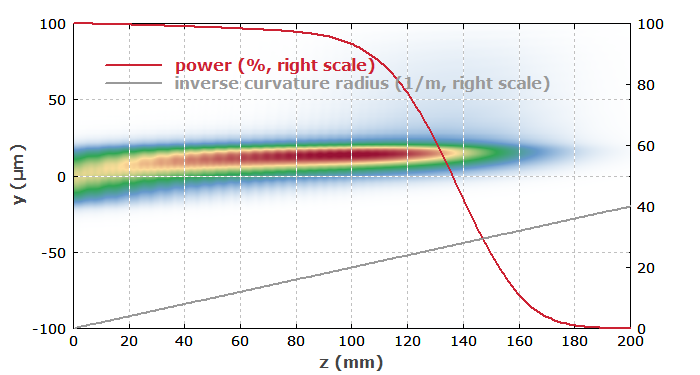 The beam propagation was numerically simulated with the RP Fiber Power software. Figure 2 shows the simulated amplitude distribution in the y-z plane. One can see that the mode gets more and shifted to one side (the outer side of the bending curve), gets substantially smaller, and finally loses more and light to the cladding. 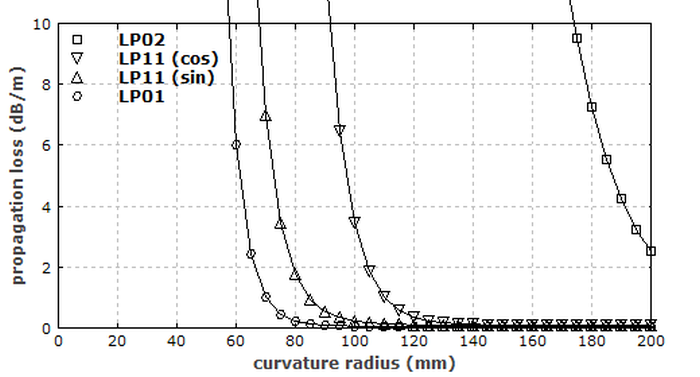 In the middle (z = 100 mm), the bend radius has reached a value of 50 mm; that is about the critical bend radius. For the LP11 mode, attenuation through bend losses gets more serious, as shown in Figure 3. Here, the bend losses set in earlier, and basically all power is lost already after 120 mm. Figure 3: Same as Figure 2, but for the LP11 mode. Figure 4: Bend losses as a function of the bend radius for different guide modes of the fiber. Go to Part 8: Fiber Couplers and Splitters or back to the start page.